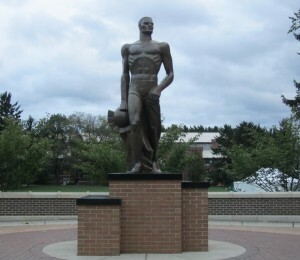 I have been studying in Michigan State University in East-Lansing. This is a great place, you could say that the campus is a town itself. If you compare a regular Finnish campus to the campus in MSU it couldn’t be more different! As you can see the campus area is a lot bigger than for example the campus area in TAMK. Since I am writing my thesis, big and important difference for me is the library. It is open basically 24 hours a day and there is a cafeteria. In addition to doing my thesis I have also visited in different social services provided by the university. First of all in the US there is different education system which, in my case, means that in here I would graduate as a Bachelor of Social Work in stead of Bachelor of Social Services. Since in Finland we make difference between social workers and Bachelors of Social Services and in the US they don’t, it is obvious that there are also differences on job descriptions. As I mentioned, the campus is a town itself and there are different activities like student groups or activities organized by OISS (Office for International Students and Scholars). Since we are in America, you can guess that foot ball is a big deal. “Go green, go white!” echoes in the streets of East-Lansing when Spartans play. Underneath there is a photo of Spartan Statue. So there is a lot to see in MSU! I am so grateful for this experience and if someone asked, I would definitely recommend MSU for a place to study.